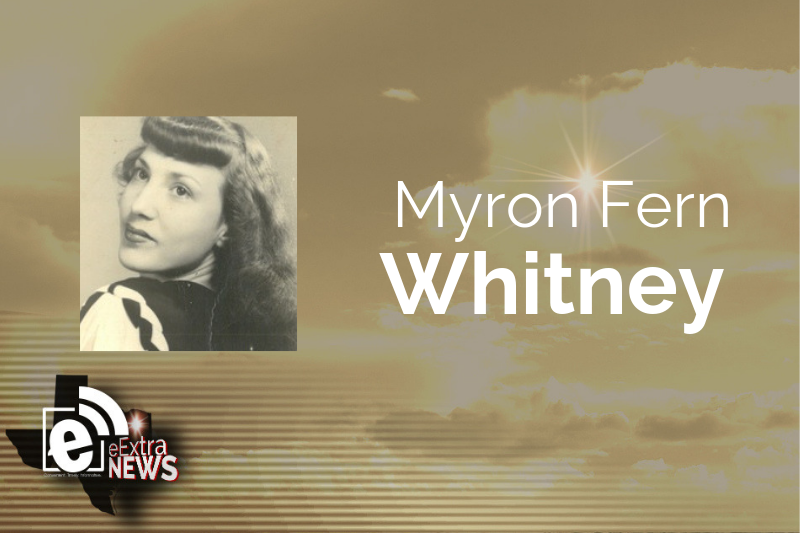 Myron Fern Whitney, age 89, gained her heavenly wings on Sunday, April 14, 2019 in Mt. Pleasant. She was born to Charlie (Chalk) and Etta Lee Whitney on March 14, 1930 at Midway in Franklin County. She is survived by her son, James Kent Whitney and daughter and son-in-law, Kathleen and Kevin Chapman. Granddaughters and their spouses, Kaci and Ryan Lyles, Kalee Chapman and Fabian Rodriguez, all of Mt. Pleasant, Kayla and Kaleb Carico of Bogata, and Amber and Brad Nevins of Masauw, Japan, grandsons, Kristopher Chapman of Ft. Walton Beach, Fl., and Clayton Whitney of Lawrence, KS, grandson and spouse, James Aaron and Nadia Whitney of Las Vegas, NV, great grandchildren, Ryder and Rayli Lyles, Kyan, Mila, and Kruz Rodriguez, Brilee and Messer Carico, Stella Nevins, and James Zachary Whitney. She was preceded in death by her parents, Brothers Rhoetus Whitney, and Milton Whiney, and sister, Christene Whitney Hall. Visitation will be Tuesday, April 16, 2019 from 6-8 p.m. at Curry Welborn funeral home in Mt. Pleasant. A graveside service will be Wednesday, April 17, 2019 at 2 p.m. in Talco Cemetery. Her family would like to express a special thanks to the staff at Focus Care nursing home, in Mt. Pleasant.